Since establishing in 1976, we have served the string instrument needs of the Midwest and the Kansas City area, providing quality repair and adjustment as well as offering new and vintage instruments for student and professional alike. I feel that my customers are my friends, and as such deserve to be treated with respect and offered the highest degree of service possible. This philosophy has allowed me the best advertising available, that of "word of mouth". I am pleased to report that my son Jesse is now working full time in the shop. 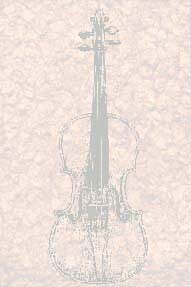 He has a keen eye for quality, able hands for repair and as an accomplished violinist, a trained ear for sound. 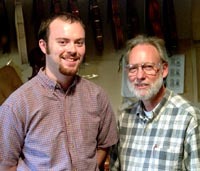 This collaboration ensures that we will be able to serve your string instrument needs for many years to come. It is universally recognized that the finest instruments available are those from the "Golden Age" of violin making in 18th century Italy, but for the majority of musicians these are financially inaccessible. The designs and methods of these great masters have been emulated by violin makers for over 200 years, producing a wealth of fine instruments to suit any budget. There has been a increased interest in violin making over the last few decades and consequently there is an excellent supply of new instruments from individual makers and workshops in many countries of the world. Occasionally I find new instruments that I feel offer extraordinary tone for the price, especially in the newer East European and Asian instruments, and I am pleased to recommend these to my clients. These violins are in the $400-3000 range. Two of my favorites are the Andreas Eastman and Andrzej Swietlinski. Fractional sizes for the younger student are also available in a variety of qualities. Call for details. We are pleased to offer an outstanding professional quality 7/8 string bass attributed to William Tarr, Manchester, England, first half of the 19th century. Click the thumbnail for additional photos. We are conveniently located in the Lee's Summit, MO. area, close to I-470. In order to provide the best possible service we are open by appointment Tuesday through Saturday. Please call, text or email to arrange a time to meet with us.